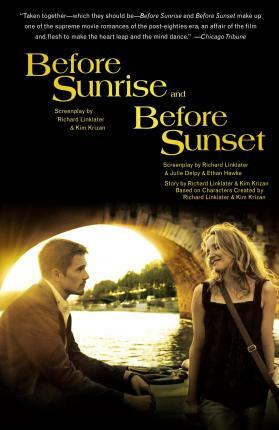 In one volume, the screenplays to two contemporary classics, directed by Richard Linklater, and starring Ethan Hawke and Julie Delpy, about the immediate and life-altering attraction between two strangers. On a train from Budapest to Vienna, Jesse, a young American student, at the end of a romance and his European trip, meets Celine, a young French woman. They are immediately attracted. Despite knowing this may be the only time they will see each other, in the next few hours in the city of Vienna, they share everything and promise to meet again. Nearly a decade later, Jesse, now a novelist on a publicity tour, sees Celine in a bookstore in Paris. Again their time is short, and they spend it reestablishing the connection they experienced on their first meeting. Romantic, poignant, understated, and often profound, these two screenplays are sure to become classics in their own right. In one volume, the screenplays to two contemporary classics, directed by Richard Linklater, and starring Ethan Hawke and Julie Delpy, about the immediate and life-altering attraction between two strangers. On a train from Budapest to Vienna, Jesse, a young American student, at the end of a romance and his European trip, meets Celine, a young French woman. They are immediately attracted. Despite knowing this may be the only time they will see each other, in the next few hours in the city of Vienna, they share everything and promise to meet again. Nearly a decade later, Jesse, now a novelist on a publicity tour, sees Celine in a bnookstore in Paris. Again their time is short, and they spend it reestablishing the connection they experienced on their first meeting. Romantic, poignant, understated, and often profound, these two screenplays are sure to become classics in their own right. Julie Delpy was born in Paris and appeared in her first film when she was fourteen. She is best known for her roles in Three Colors: Red and White. She lives in Los Angeles. Ethan Hawke is best known for his staring roles in the motion pictures Dead Poets Society, Reality Bites, Hamlet, and Training Day, for which he was nominated for an Academy Award. He is also the author of the novels The Hottest State and Ash Wednesday. He lives in New York. Kim Krizan has written numerous screenplays, including historical biographies of Mata Hari and Anaïs Nin that are currently in development. She appeared as an actor in Slacker, Dazed and Confused, and Walking Life. She lives in Los Angeles with her husband. Richard Linklater, a screenwriter and director, has made twelve films, including Slacker, Dazed and Confused, Waking Life, and School of Rock. He is based in Austin.